As artists of faith, we refer to the “soul” a lot. We talk about playing with soul, expressing from our soul, putting our heart and soul into our art. We sings songs about our souls, to our souls, from our souls. There is soul food, soul music, soul sisters, soul catchers, soul mates, soul patches. We understand implicitly that the soul refers to something mysterious and eternal and deeply rooted in the very essence of who we are. But if pressed toward a definition of the soul, I’m afraid most all artists of faith would be lacking in any theologically correct explanation. Just what is the soul exactly? I recently read a quite engaging and thought-provoking book on the soul, Soul Keeping, by John Ortberg, and his teaching is based on some deeply-moving, end-of-life conversations with the late Dr. Dallas Willard. (I highly recommend you read the book for a more complete treatise.) He makes the case that the care and nurturing of our souls might be one of the most important things we do. In fact, I’m becoming convinced that a complete and biblical understanding of the soul is essential to artists of faith. 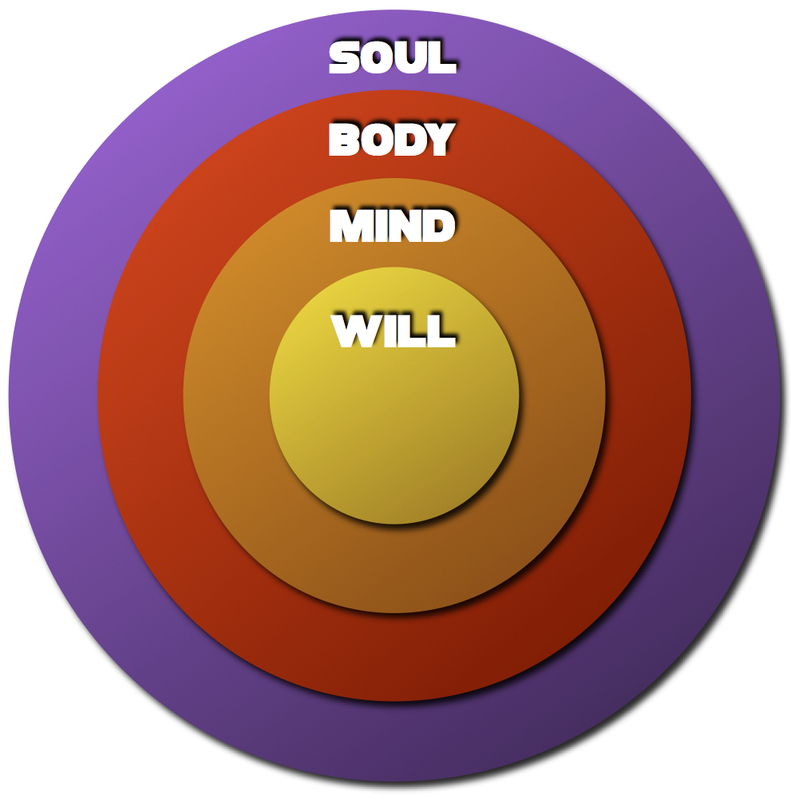 The soul can be described as a series of concentric circles (see diagram). In the center is our will. This is our free will—the human capacity to choose and create—and our intentions, judgements, and sense of self spring from this. The second concentric circle is the mind. This includes our thoughts, our memories, our emotions, our values, and our conscience. Habits (good and bad) and ways of thinking (good and bad) are created here, and this is also where we as artists of faith hone technique and create personal preferences and discover individuality in our art making. Interestingly, our will alone is often not enough to override our sin nature. We must also renew our minds by retraining our habitual thought patterns as well. The third concentric circle is our body—our physicality in the universe—which gives us the ability to act on our will and mind. This third circle includes everything from eating, sleeping, hugging, dancing, painting, playing a musical instrument, to body language and facial expression. It’s important to note that we don’t have a body and a soul—our body is a part of our soul. And that makes sense, if you think about how the chemical makeup of our bodies and brains is so highly interconnected to our thinking and feeling. And now we can begin to define the soul. There are many implications—both large and small—from this more complete understanding of the soul. The soul is more than just the sum of the parts. It is also the integration, or the alignment, of the whole self in harmony to and through God. We are intended to be fully integrated—where our will and mind and body are all aligned with ourself, with others, with creation, and with God. This is the well-ordered life that we desperately and innately desire. And God desires this for us as well. Unfortunately, we have a tendency to live “dis-integrated” lives, where our will and our mind and even our bodies are at odds with itself. The surrender of our wills and the renewing our minds is counter-intuitive to the world. So we devote ourselves to many wrong activities, tell ourselves lies about our selves and our motives in our thought-life, spend much too much time on image management. Truth be told, we are much more motivated by fame and narcissism and self-seeking pleasures and mind-numbing addictions than we would ever admit. We don’t understand that “being saved” as a Christ-follower really means being saved into an integrated soul, living in a way that is fully aligned to God’s intentions for us. And this is why this is so important for artists of faith to understand this. Our soul is where our art emanates. Creativity comes from the very center of the circle, from our free will. This is God’s great gift to us—this profound Genesis 1 action—being able to create as the Creator does. From the second circle, the mind, come the qualitative aspects of our art, like style and genre and expertise and technique, as well as the enjoyment we receive from our art. From the mind comes our passions and our uniqueness. 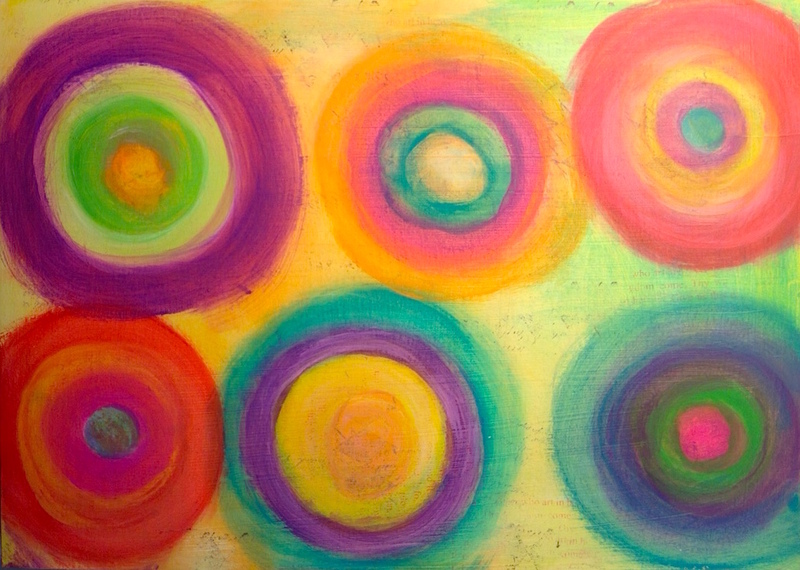 And the third circle, the body, is how we are able to paint and write and dance and create. For we as artists need our hands, our mouths, our feet, our eyes and ears, our very breath, to participate in the creative action, birthing our ideas into sonnets and sculptures and music into the world. Here is an epiphany for artists of faith: This is the reason why we feel most free when we are totally immersed in our art making. Because art making is an exercise that allows our will (intentions) and mind (emotions, passions, intellect) and body (physicality)— the totality of our soul—to align to God. When I am writing or composing or designing or creating, my soul feels aligned to that which God made me, to which God called me. This is the essence of what it is to be an artist of faith. There have been countless times when I have talked to a painter about the art of painting, or the chef about the art of cooking, or the sax player about the art of improvisation, or the ballet dancer about the art of dance. And they speak deeply of the almost magical, ethereal convergence of that moment, when we feel so fully alive. I am becoming more and more convinced that this is a taste of heaven, when our soul is fully aligned to itself, to God, to all of creation. This has many far-reaching implications, in my view. The act of creativity, particularly in the arts, physically and emotionally and willfully aligns us to the things of God. It can be, in a very unencumbered sense, an act of spiritual formation. And this explains why art making can be, in a deeply spiritual way, an act of worship as well. We find ourselves, through the creative process, communing and cooperating with the Holy Spirit, with our whole being. And this alignment of our whole selves with God also allows us to experience God-breathed joy in the process. And finally, this model of the soul also can explain why things like ego and selfishness and false identity and relational conflict—things which are typical of artists—keep us from experiencing true joy and completeness as artists. I am only now grasping all the implications associated with understanding the soul as an artist of faith. I’d be interested in your thoughts as well. Posted in art, Blog, faith, Imagine That, made in the image of GodTagged art, artists of faith, creativity, faith, soul, worshipBookmark the permalink. Very good. I appreciate this. Thanks Manuel! There is so much ground to cover regarding creativity and it’s role in spiritual formation. Thanks for mining on this topic. You hit on some undeniable truths! Bless you, Manuel. It’s been busy here on the ranch. We’ve been in a bad drought but it is raining today. Good news: my latest novel, Looking for Lynne, has been nominated for a Will Rogers Medallion Award. My wife and I go to Fort Worth later this month to hear the winners announced. It presents the Word in a literary, secular, cowboy way to a largely secular audience. Congratulations John. You’re an inspiration to those of us who are learning to run the good race. Blessings!